If you have enough instinct to react to incoming defenders and you need a hockey stick that will keep up, then keep reading this review because the Kookaburra instinct might be for you. Kookaburra’s i-Bow shape is designed for the dribbling playmaker in the team, perfectly poised at 275mm up from the heel with the big Kookaburra 24.5mm curve, this Kookaburra Instinct is balanced to help players react quickly with the ball at their stick. With paragraphs like the above, maybe Kookaburra should sign me up to their marketing team, however the point is true, this stick is awesome to dribble with. 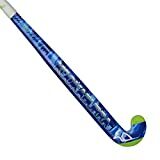 The shape of this shaft is very similar to the Malik dribble curve and the Kookaburra Instinct finds its way in to the Top 5 Field hockey stick’s to dribble with alongside our Malik friends. Absolutely key to the dribbling prowess of the Kookaburra Instinct combining perfectly with the shape of the shaft is the shape of the head. This field hockey stick has the Euro Maxi head, which is thinner than the standard Maxi, has a more rounded and slightly wider heel than other Maxi shapes. All these attributes aid ball control when on the move. Now fantastic dribbling isn’t enough on it’s own, there are few goalies that will let you dribble round their huge pads, not easily. So you will be pleased to review that the Kookaburra has what it takes to finish the run. Power from the Kookaburra Instinct to pass or shoot comes in a couple of key features. KVR is the best feature to help hit the ball hard, this brings a spin right through the head of the stick that increases surface area and makes the head hit the ball harder. There is also a high carbon content in the Kookaburra Instinct at 85% carbon and 15% fibreglass this is a high composite of carbon and that aids power transfer through the ball. It is worth noting that I always review Kookaburra high carbon sticks don’t feel quick as stiff brands. You will not get the crisp ping from the Kookaburra Instinct that you get from an Osaka, Grays or adidas hockey stick. This is partly due to quality of the carbon but mainly due to features designed to give more feel of the ball. Soft Feel Resin in included under the skin of the head to give a cushion effect for receiving the ball and for close control when dribbling. Though it works slightly to the contrary of achieving powerful hits, SFR is welcomed in almost all other areas of play. The Kookaburra Instinct is a great option for the field hockey playmaker. Midfielders who love to travel with the ball can not go far wrong with this field hockey stick from Kookaburra, the balance, the head, the weight is all made perfectly to suit. A great hockey stick to review, the Instinct from Kookaburra should fit your needs perfect and it’s a great price too. If you want more power but are looking to review a Kookaburra stick with the fantastic iBow shape from dribbling, you will have to move to the top of the range and review the Team Ignite stick here. Still not sure? Did you know you can create a hockey stick comparison chart on our site? Jump back to our hockey stick review main page and select some sticks to review, then you will be given the option at the bottom of the screen to start a comparison.